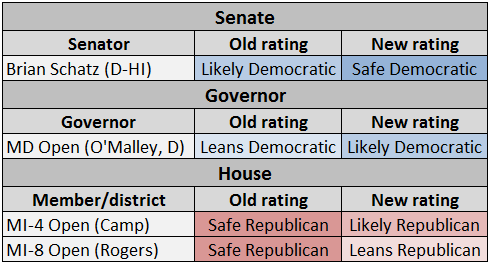 In addition to our new Crystal Ball Outlook for the House, Senate and gubernatorial races, we have a few tweaks to make to our ratings this week. To get our ratings changes as they happen, follow the Crystal Ball team on Twitter — @LarrySabato, @kkondik and @geoffreyvs — and check our website’s Ratings Changes page. HAWAII (SEN): On Monday, this race got a big “aloha” from President Obama when he endorsed appointed Sen. Brian Schatz (D) in the Democratic primary. Unlike in some other states, the president remains relatively popular in his birthplace, and polls have shown Schatz and his primary opponent, Rep. Colleen Hanabusa (D, HI-1), in a neck-and-neck battle. Obama backing a candidate in the state of his birth could be the rare endorsement that matters. The Democratic match-up will also be influenced by race and faction. Hanabusa was viewed as the late Sen. Daniel Inouye’s (D) preferred successor, but after Inouye’s death in December 2012, Gov. Neil Abercrombie (D) instead put Schatz, his lieutenant governor, in the seat. This decision has even complicated Abercrombie’s own gubernatorial reelection race as it upset some Asian-American Democrats, many of whom were close friends and allies of Inouye’s, creating a base of support for Abercrombie’s own primary opponent, state Sen. David Ige. Abercrombie and Schatz are white, while Ige and Hanabusa are Asian-American. The other news from the central Pacific is the decision by ex-Rep. Charles Djou (R) to run for Hanabusa’s now-open seat. Djou previously represented Hawaii’s First for a few months after winning a special election in May 2010, but lost to Hanabusa in the general that November and then again in 2012, although he performed admirably both times. With Djou running for the House seat that Hanabusa is vacating, Republicans won’t have a nominee to take advantage in the general election, even if the Democratic Party is deeply divided after the primary. This race moves from Likely Democratic to SAFE DEMOCRATIC. Despite Djou’s entry, the open HI-1 House district remains Safe Democratic for now. MARYLAND (GOV): Two February polls from the Baltimore Sun and Washington Post show Lt. Gov. Anthony Brown (D) with a large lead in the Democratic primary, albeit with large numbers of undecideds. Between internal and public polling, Brown has held a consistent edge in this contest over his main opponent, Attorney General Doug Gansler (D), and has to be seen as the favorite in the June 24 contest (Heather Mizeur, a liberal state delegate, is also a credible candidate). Meanwhile, the GOP race is wide open, with both the Sun and Post surveys finding over half of Republicans and Republican-leaners undecided. Regardless, it increasingly looks like the GOP will struggle to put forth a standard bearer who has any real chance to win the race to replace outgoing Gov. Martin O’Malley (D). Looking toward November, Brown and his running mate had around $7 million in their war chest at the start of 2014 while Gansler’s ticket had $6.3 million. To put that in perspective, no GOP candidate had over $200,000 in the bank, though ex-state cabinet secretary Larry Hogan (R) hadn’t joined the race at the time of the most recent filing. Besides money, Maryland is a true Blue state: It has elected exactly one Republican, Bob Ehrlich in 2002, as governor in the last 44 years. The Old Line State is also just one of six states where President Obama actually won a larger share of the vote in 2012 than in 2008. Given all this, we’re moving this race from Leans Democratic to LIKELY DEMOCRATIC. Even that new rating may be understating the Democratic advantage. MICHIGAN (HOUSE: MI-4 and MI-8): Two high-ranking House Republican committee chairmen from Michigan, Reps. Mike Rogers (R, MI-8) and Dave Camp (R, MI-4), announced their retirements this past week. The two Central Michigan representatives were rumored to be top choices of the National Republican Senatorial Committee to run for the Wolverine State’s open Senate seat; not only did they pass on running — Terri Lynn Land, a former Michigan secretary of state, is the party’s presumptive nominee — but they are leaving Washington altogether. Both men represent districts that, on paper, could flip to Democrats: Their districts each narrowly supported President Obama in the 2008 election but switched to Mitt Romney in 2012. Rogers’ MI-8 backed Romney 51%-48%, while Camp’s MI-4 gave him a bigger 53%-45% edge. While the GOP of course would prefer entrenched incumbents like Camp and Rogers to stick around — neither was in any danger of losing — they both did their parties a favor by retiring this year as opposed to two years from now, because the national climate might be worse for Republicans in 2016 than this November. Their retirements also come fairly close to the April 22 primary filing deadline, which poses a challenge to both parties, but particularly Democrats, in recruiting candidates. As the fields get sorted out on both sides, Republicans retain a generic edge in both districts: MI-8 moves from Safe Republican to LEANS REPUBLICAN, while MI-4 goes from Safe Republican to LIKELY REPUBLICAN.